A new study reveals that a successful response to weight loss is associated with the early and sustained improvement in the functioning of pancreatic beta cells. Study: A clinical trial recently showed that nearly half of individuals with type 2 diabetes achieved remission to a non-diabetic state after a weight-loss intervention delivered within 6 years of diagnosis. Now a study reveals that this successful response to weight loss is associated with the early and sustained improvement in the functioning of pancreatic beta cells. This finding challenges the previous paradigm that beta-cell function is irreversibly lost in patients with type 2 diabetes. This traditional view was recently challenged by results from the United Kingdom-based Diabetes Remission Clinical Trial (DiRECT) overseen by Taylor. The participants, who were diagnosed with type 2 diabetes within 6 years of the start of the study, were randomly assigned to best-practice care (control group) or an intensive primary care-led weight-management program (intervention group). One year later, 46% of the individuals in the intervention group successfully responded to weight loss in that they recovered and maintained control over blood glucose concentrations. Some non-responders simply had not lost enough weight, but in those who had, it was not clear how their response differed from that of responders. 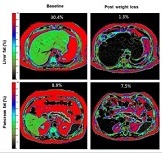 Illustration: This figure shows cross sectional MRI images are displayed with pixels color-coded for fat content. In this individual, the high liver fat at baseline (30.4 percent) decreased to 1.3 percent after weight loss. The lower panels, at the level of the pancreas (outlined in white), show the decrease in pancreas fat (8.9 to 7.5 percent) associated with the restoration of first phase and maximal insulin secretion. Credit: Taylor et al.